Jenny Kane - jkane@shawmedia.com McHenry high school east campus student Taylor Ley, 18, tries on a prom dress as her grandmother Lucy Delmonico adjusts the hemline and her mother Karin Ley holds a mirror for her to look at the dress during the My Sister's Dress event. The benefit was held at McHenry County College on Sunday. Women from around the area donated their prom dresses to the organization so that hundreds of high school girls could buy them for $25. The proceeds of the benefit went to Big Brothers Big Sisters of McHenry County. Jenny Kane - jkane@shawmedia.com McHenry High School east campus student, Delaney Buenzli, 17, (right) helps her sister Casey Buenzli, 15, (left) try on a dress during the My Sister's Dress event. The benefit was held at McHenry County College on Sunday. Women from around the area donated their prom dresses to the organization so that hundreds of high school girls could buy them for $25. The proceeds of the benefit sale went to Big Brothers Big Sisters of McHenry County. 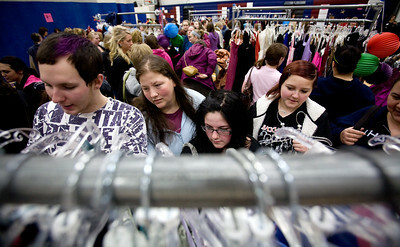 Jenny Kane - jkane@shawmedia.com After opening the doors to the My Sister's Dress sale hundreds of teenagers and their parents flocked to the racks of dresses at McHenry County College on Sunday. Women from around the area donated their prom dresses to the organization so that hundreds of high school girls could buy them for $25. The proceeds of the benefit sale went to Big Brothers Big Sisters of McHenry County. The doors opened at 10 o'clock in the morning, and the first girl in line had been waiting by the doors since 7:30 AM. McHenry High School east campus student, Delaney Buenzli, 17, (right) helps her sister Casey Buenzli, 15, (left) try on a dress during the My Sister's Dress event. The benefit was held at McHenry County College on Sunday. Women from around the area donated their prom dresses to the organization so that hundreds of high school girls could buy them for $25. The proceeds of the benefit sale went to Big Brothers Big Sisters of McHenry County.